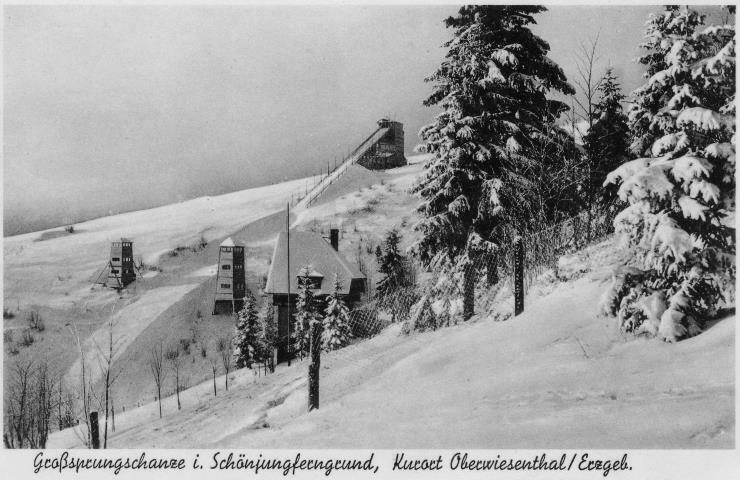 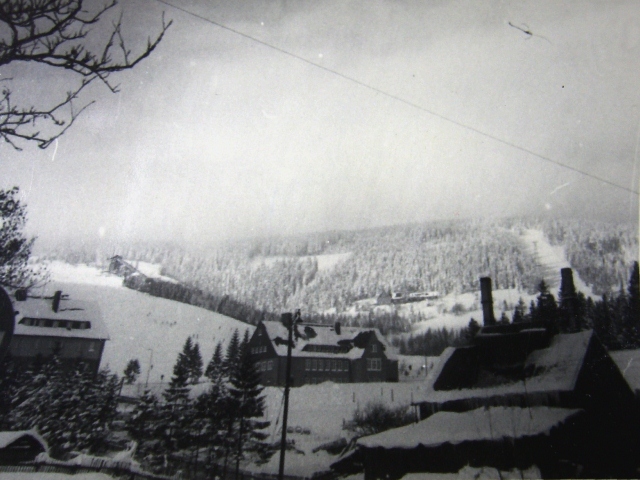 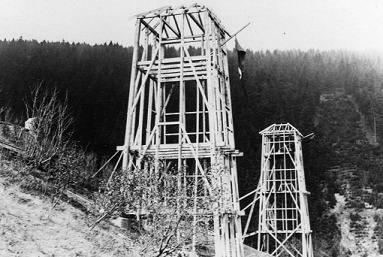 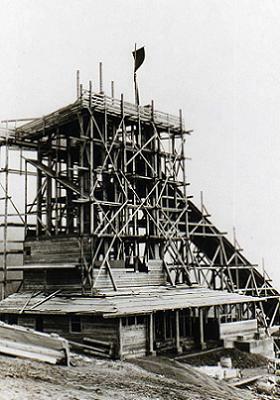 Already in 1911 on Schönjungferngrund-Schanze in Oberwiesenthal the German Championships were won with a distance of 12 m.
The old Fichtelbergschanze with large wooden inrun tower was inaugurated in 1938 after two years of construction time. 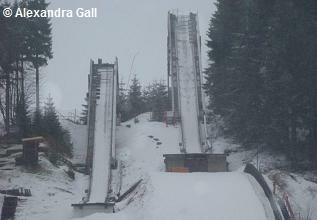 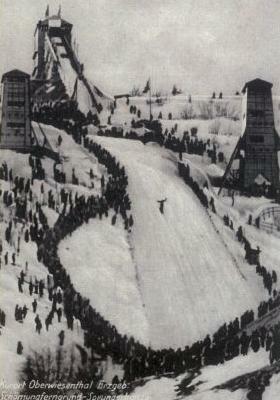 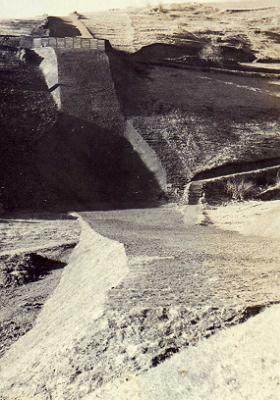 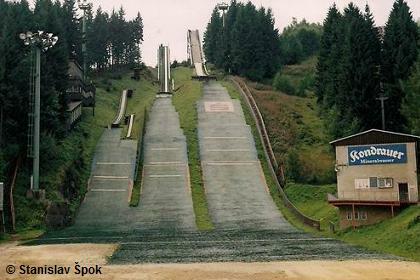 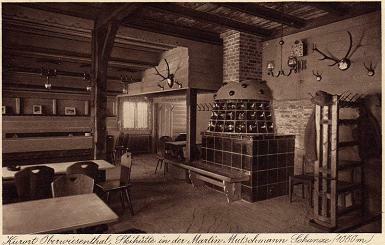 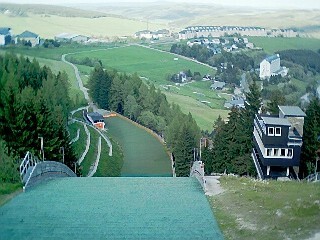 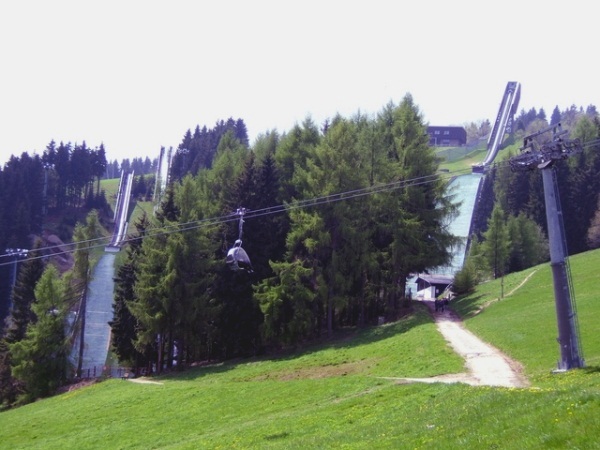 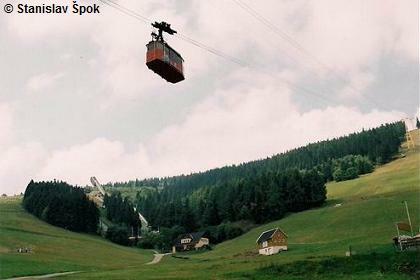 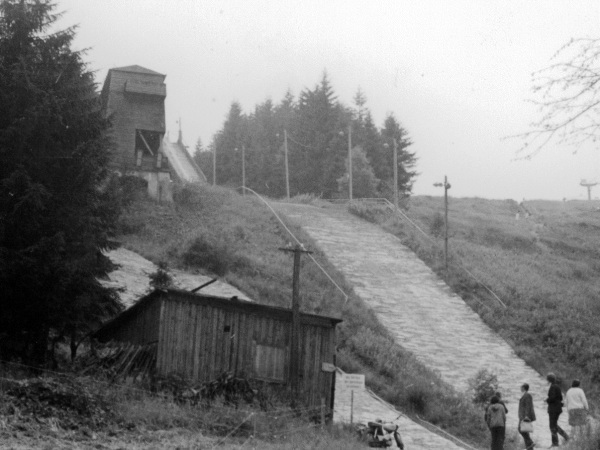 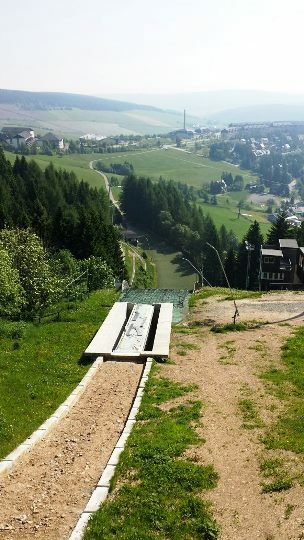 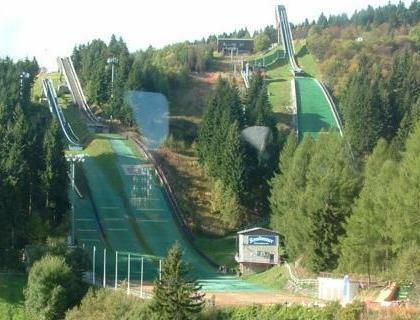 Until 1945 it was called “Martin-Mutschmann-Schanze” and was one of the most modern jumps in Germany. 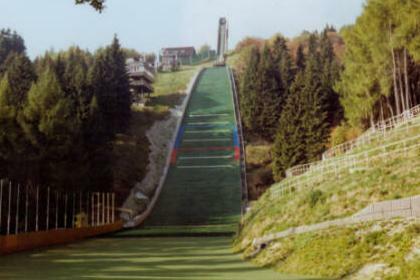 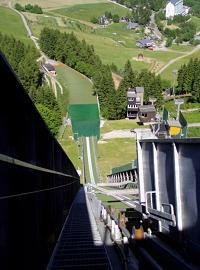 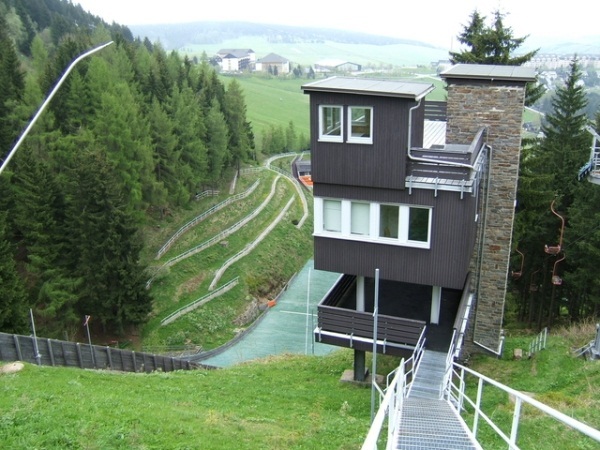 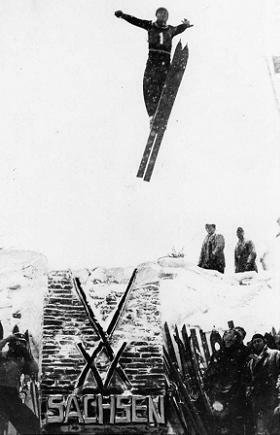 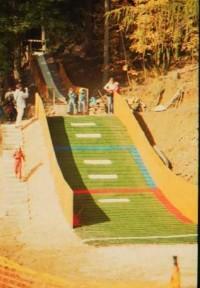 Jumps were even about 80 meters long, the last hill record was held by J. Raska (CSSR) in 1970 with 85 meters. 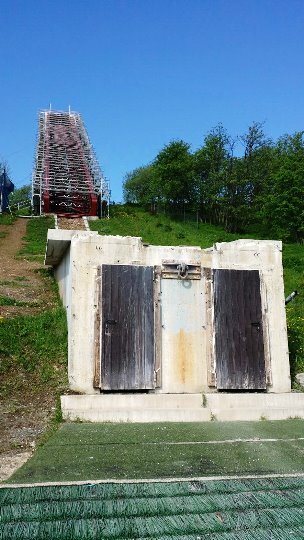 After the destruction a complete new Fichtelbergschanze with steel inrun tower and K90-profile was created from 1972 to 74. 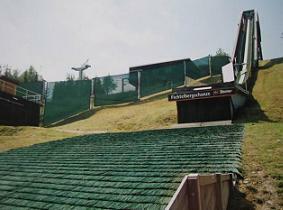 In 1991 the normal hill was again converted and equipped with a glass inrun and plastic covering. 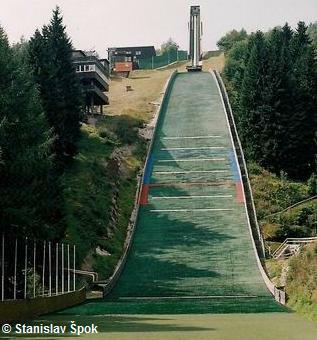 At his final goodbye-competition on his home ski jumping hill Jens Weißflog flew a new hill record of 102 m in 1996. 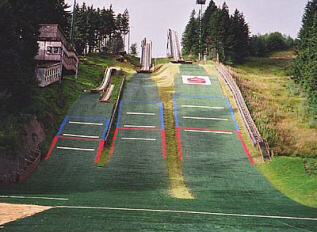 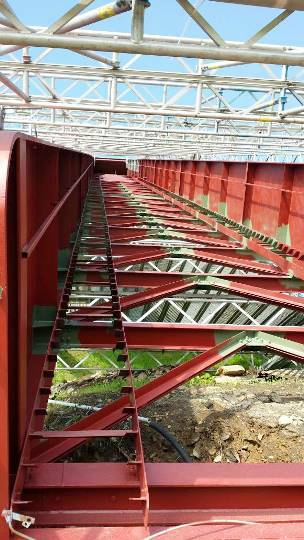 From 2000 to 2002 the profile of the jump was completely reconstructed with a new K-Point of 95 meters. 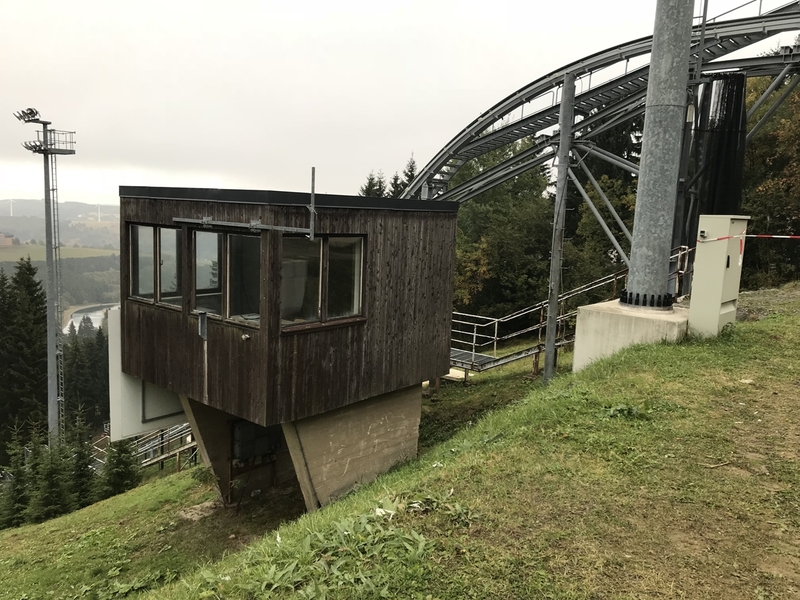 By the way, the youth ski jumps K50 and K40 got so-called “Freitag” inrun towers in 1983/84, named after the technical constructer. 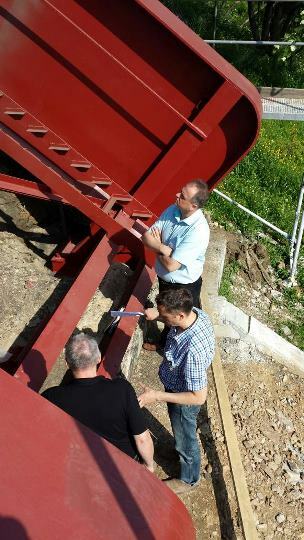 Therewith it was possible to change hydraulically the inrun angle in 4 minutes from 31 to 39 degrees. 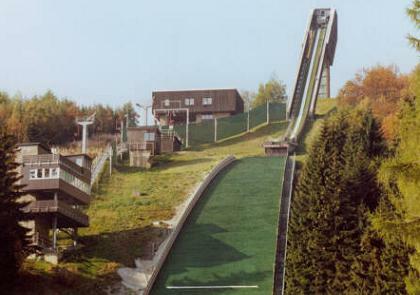 Several youth hills in the GDR got this system. 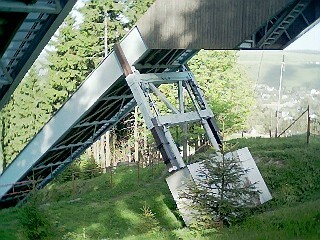 But the very complicated construction wasn’t successful after the introduction of the Happle seat in the 90’s. 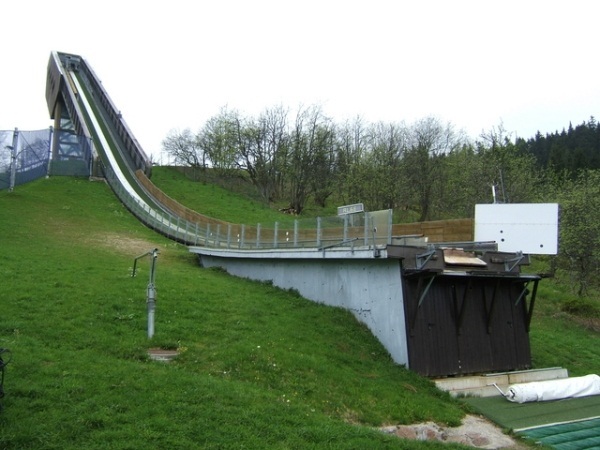 For the youngest ski jumpers at Oberwiesenthal, on October 3, 2004 the new K9 Mini-Mattenschanze was opened. 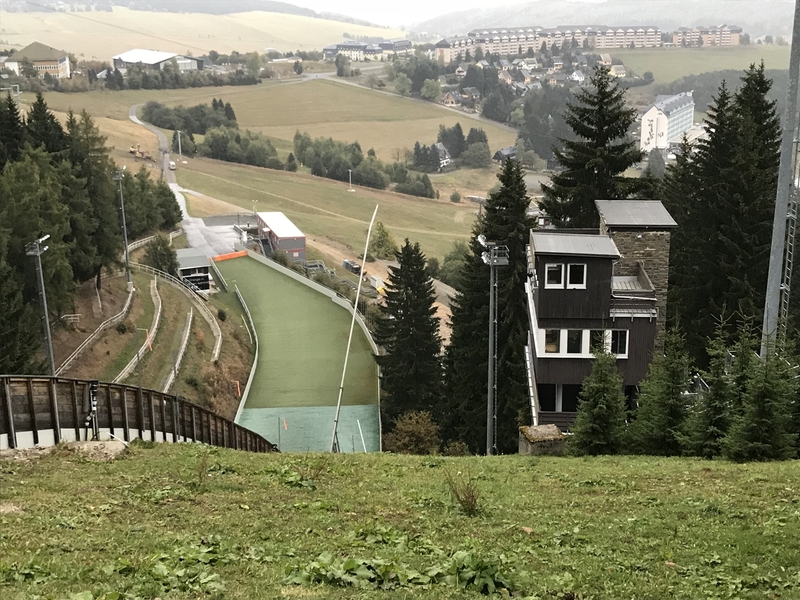 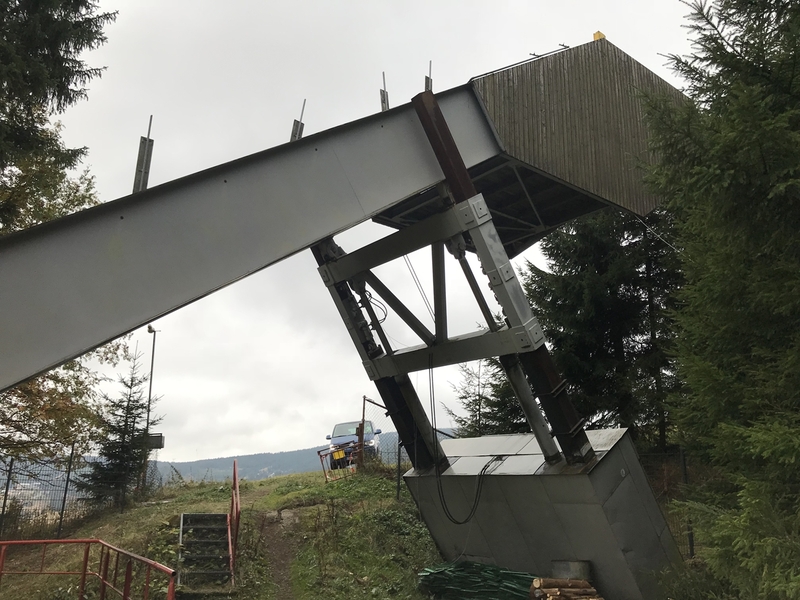 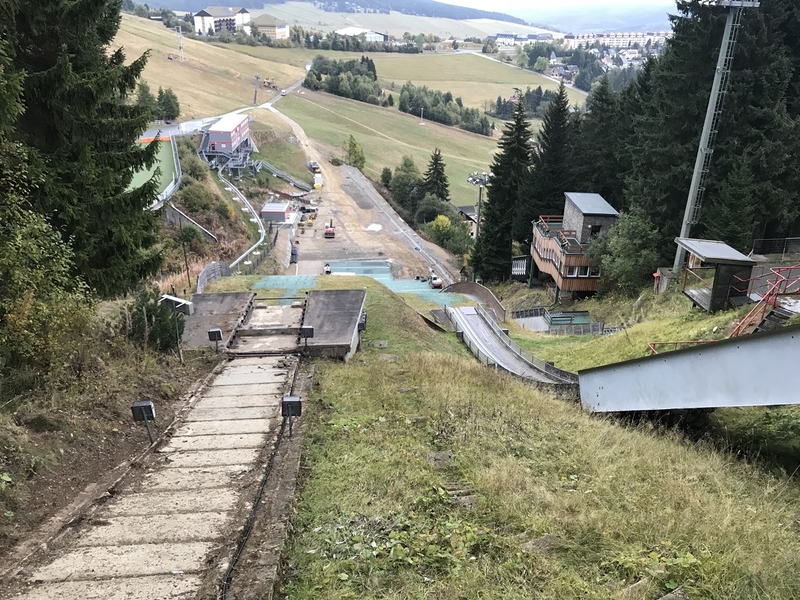 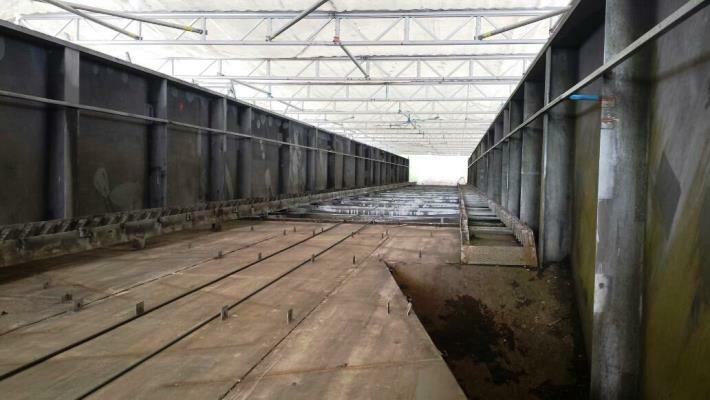 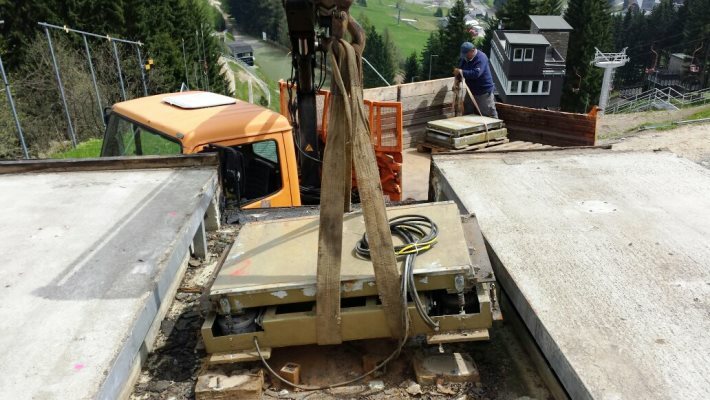 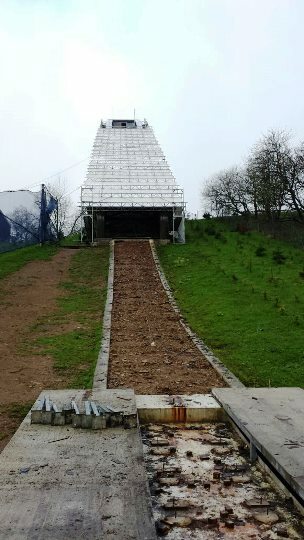 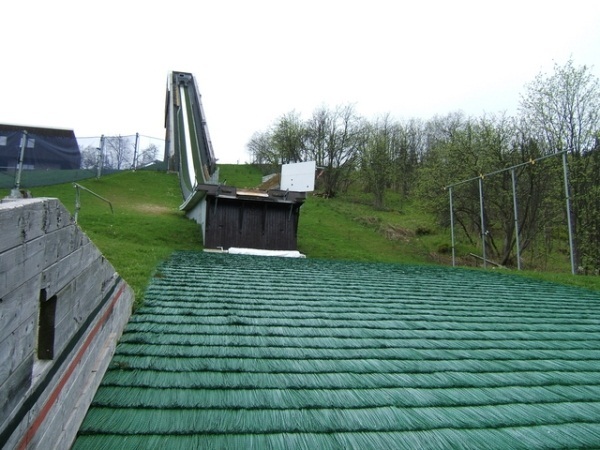 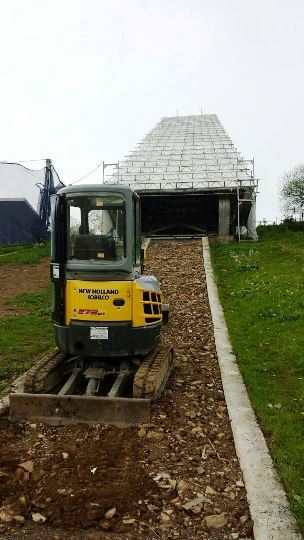 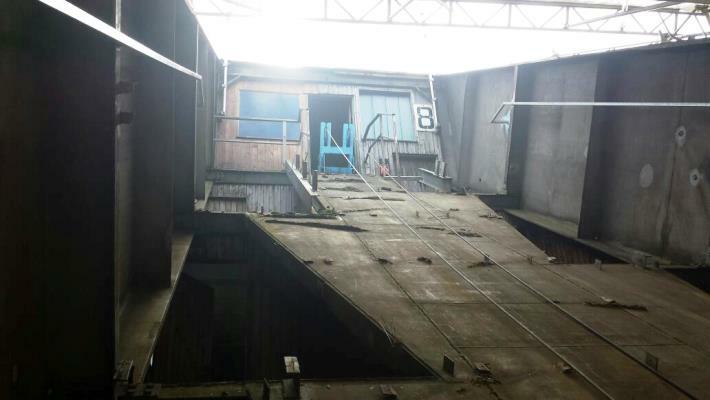 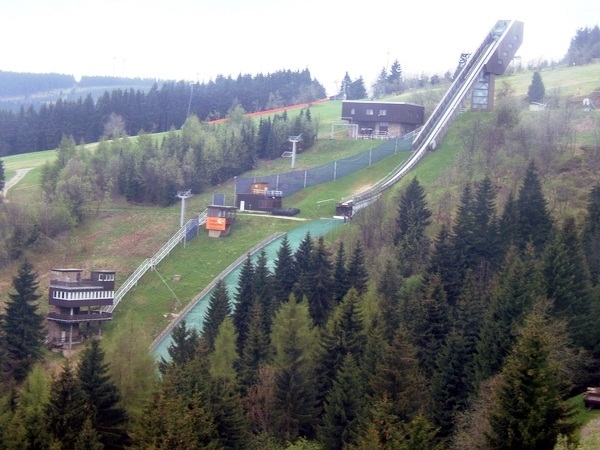 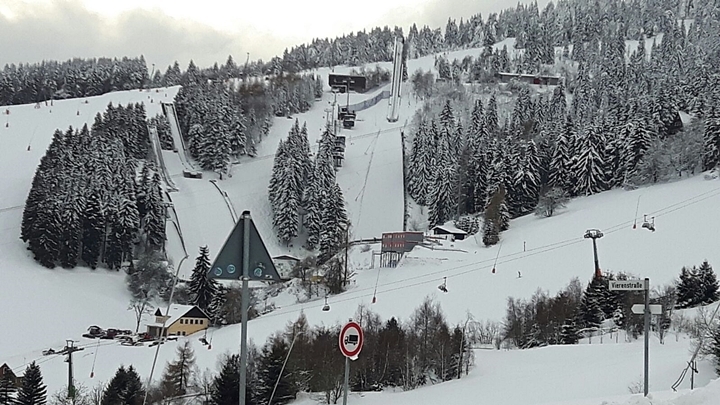 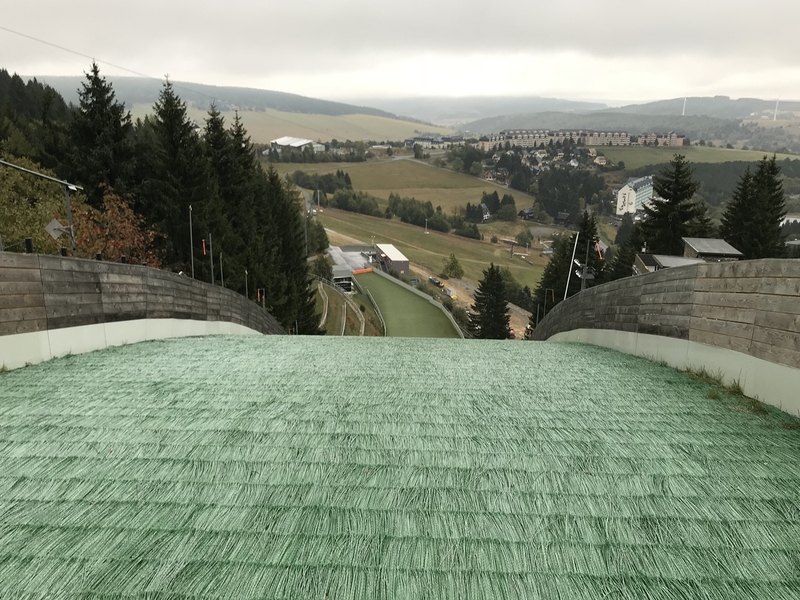 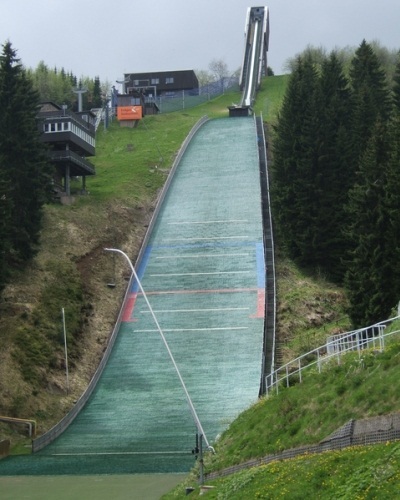 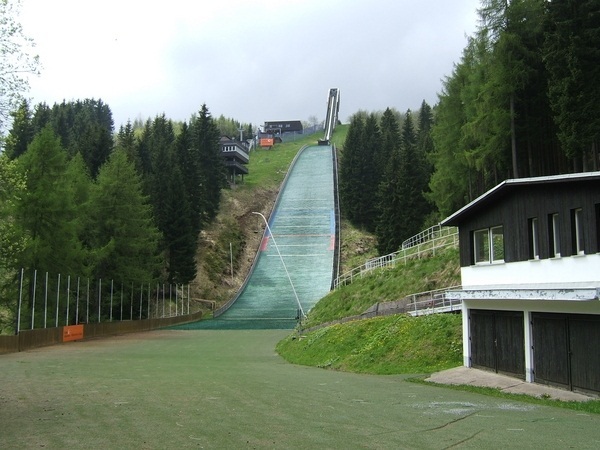 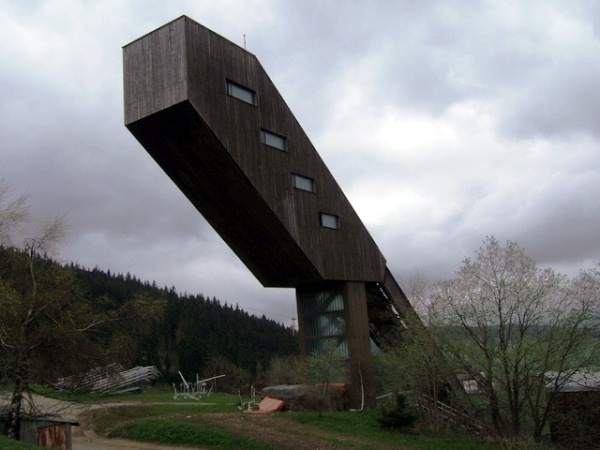 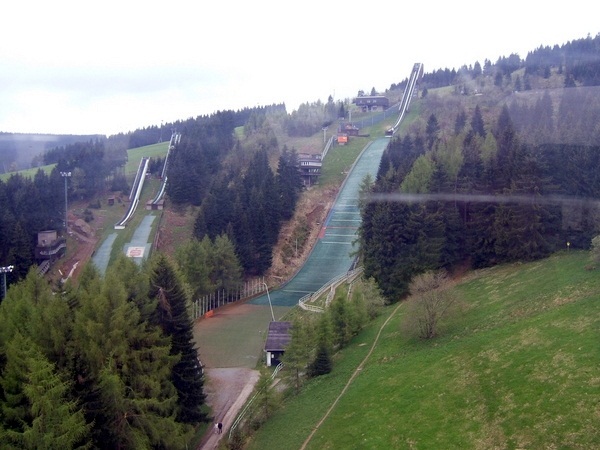 After the general condition of Fichtelbergschanze had become worse over the past years, in late 2011 the planning of a around 1.8m Euro expensive modernization of the K95 ski jump has started. 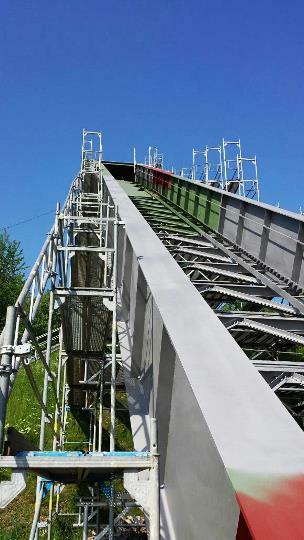 Mainly a new inrun track will be installed and floodlights be set up. 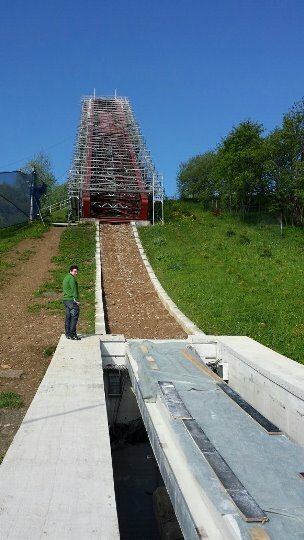 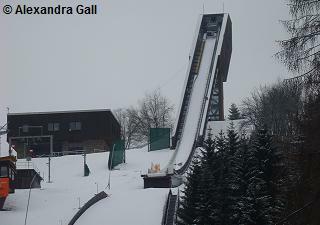 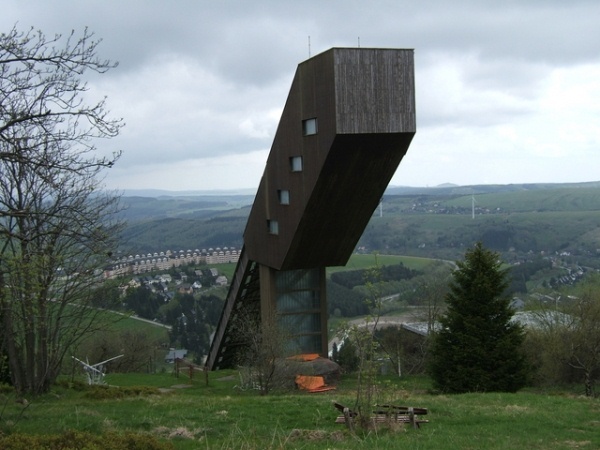 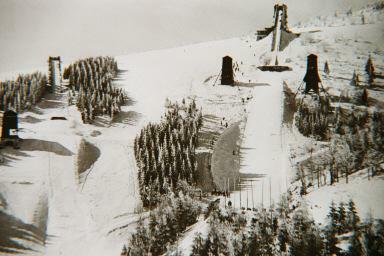 With its biomechanical platform, a measuring facility for the forces during take-off, the ski jump is an important part of the Olympic center Oberwiesenthal. 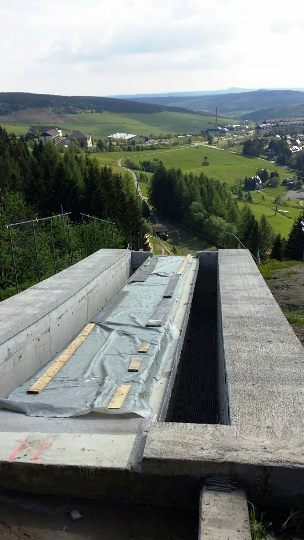 The construction works started in spring 2013 and for the re-opening of HS 106 a summer Grand Prix of Nordic Combined was hosted in August 2013. 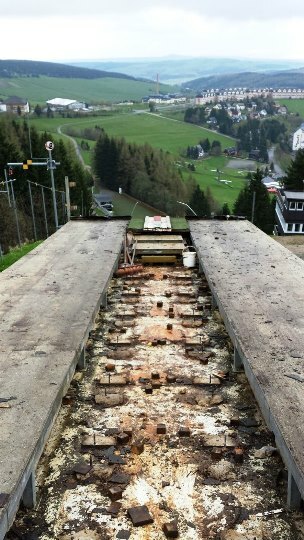 Waren gestern bei den Schanzen. 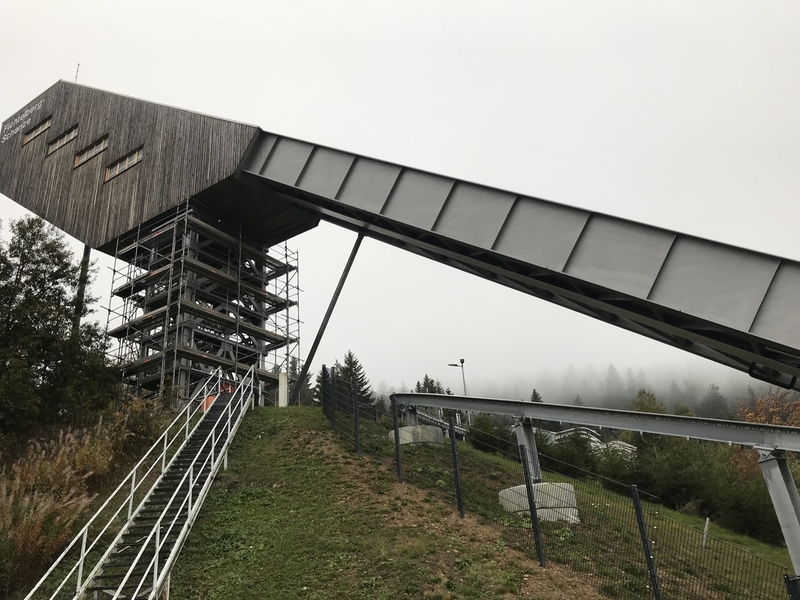 Ganz schön verkommen das ganze. 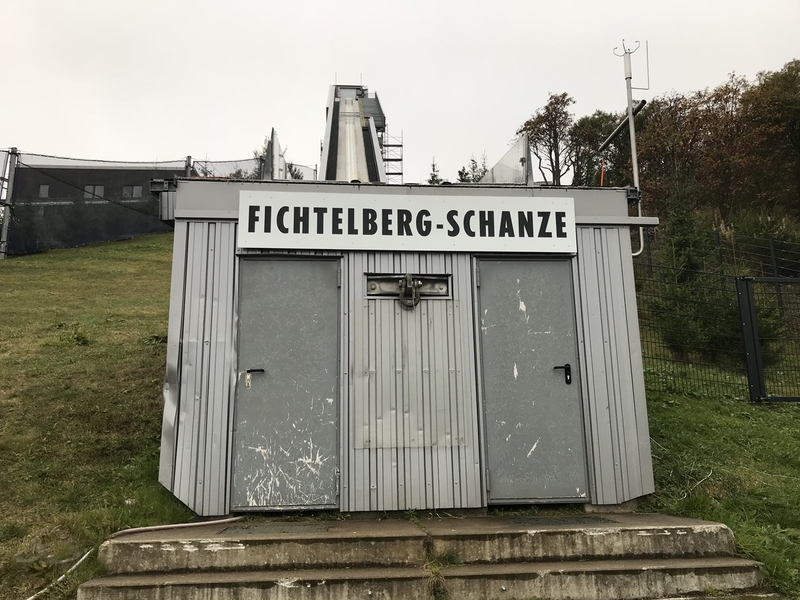 Haben extra angerufen, ob man auf die Schanze kann und dieses wurde bejaht. 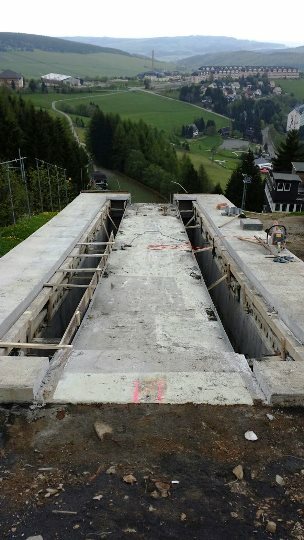 Waren sehr enttäuscht über den gesamteindruck. 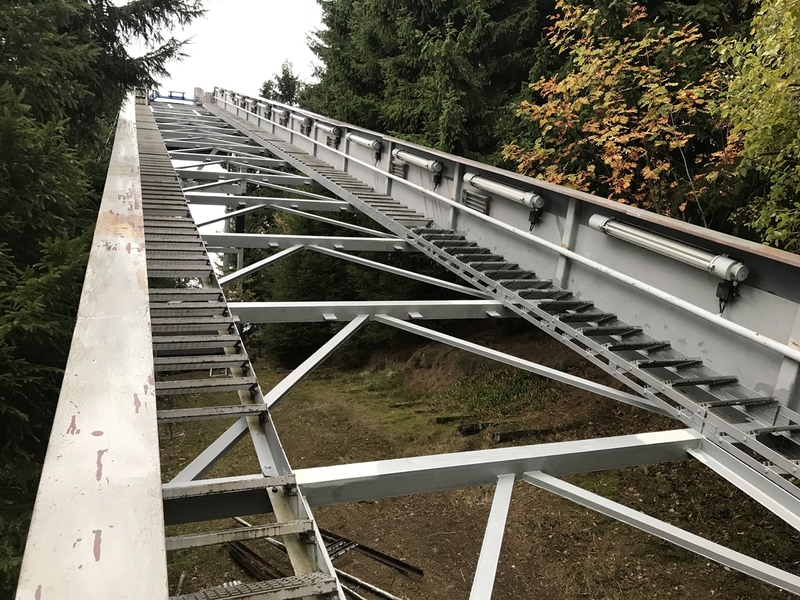 Hätten wir und die Anreise aus Berlin besser gespart. 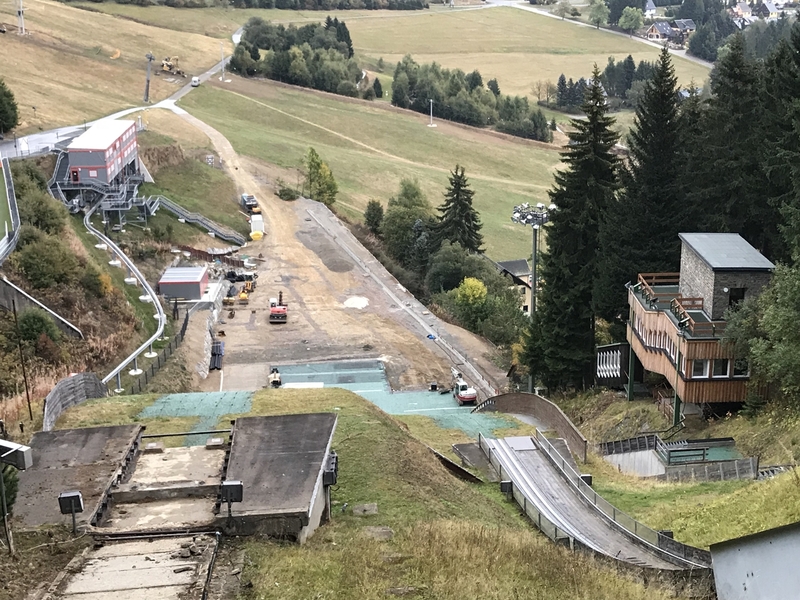 Szukałem informacji odnośnie zimowego rekordu skoczni Jana Schmida 105 m no i wiadomo, że rekord ten ustanowił w zawodach Pucharu Świata 'B', który rozegrany został w styczniu 2003 roku, a konkurs był wówczas tylko jeden więc chyba można przyjąć datę konkursu jako datę rekordu, byłoby to więc 19 stycznia 2003 roku. 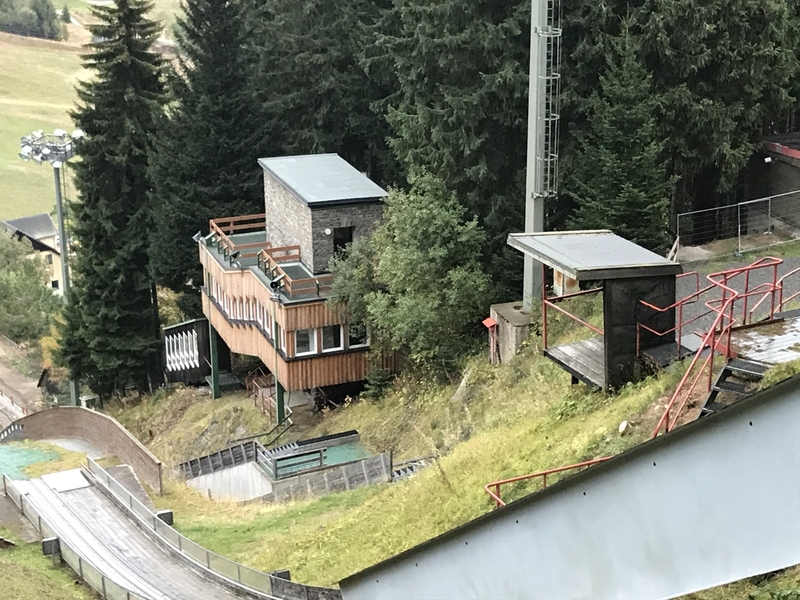 Ten rekord skoczni nie jest już aktualny, bo dzisiaj Mario Seidl uzyskał aż 108,5 m! 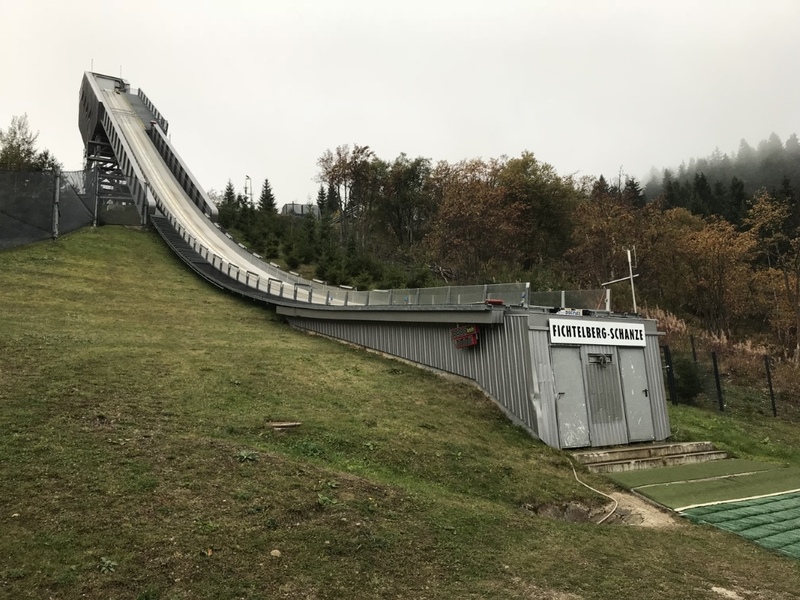 W piątek padł nowy letni rekord tej skoczni.